This book offers parents an understanding of the key tools required to give your child the best start in learning to read and write. It is based on the simple concept that how you talk, read and write with your child will directly affect their success in reading and writing for t... read full description below. This book offers parents an understanding of the key tools required to give your child the best start in learning to read and write. It is based on the simple concept that how you talk, read and write with your child will directly affect their success in reading and writing for the rest of their lives. Frances Adlam is an educationalist who has vast experience in guiding parents to raise a child who thrives at reading and writing. In this book she shares toolkits of key ideas that you can use to enhance this process. You will be encouraged to know that your child's aptitude for learning to read and write at school is largely shaped by the language, reading and writing experiences you offer her or him from birth, something that is easily achieved by any engaged parent. Frances also explains how to work with children with learning differences, such as dyslexia. Weaving together science-based evidence with her work in the field of education, Frances shows how, in this busy, technologically based world we live in, the way to grow a child's brain for success in reading and writing is based on child development principles of positive relationships, communication, language and self-expression. Raise Your Child to Read and Write is an indispensable guide for all parents of children from birth to seven years, who want to optimise their child's learning development. 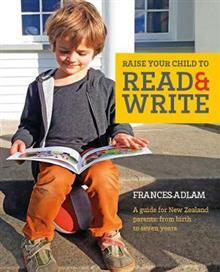 FRANCES ADLAM is one of New Zealand's most sought-after and innovative educationalists. She has worked in all areas of the educational world as an advisor, lecturer, presenter, writer, and teacher. With a background in the arts and qualifications from the UK and New Zealand in education, literacy, learning differences and narrative therapy, Frances is renowned for her distinctive and creative approach to working with students, parents and teachers. It was on a hugely successful tour of her Playful Literacy workshop that she was encouraged to share her knowledge of how young children learn to read and write with parents, which was the genesis of Raise Your Child to Read and Write.